Judaism and Islam both follow the lunar cycle to date their yearly religious celebrations and so do Christians when it comes to Easter. Whereas Moslems and Jews are concerned with the first sightings of the moon after its new phase, as an ultrathin waxing crescent, Christians celebrate Easter with the nearly full moon having an importance in the dating process. In all situations, the dates of religious occurrences, based on the lunar phase cycle of 29.53 days, vary from year to year because this interval of time does not divide integrally into the number of days in a year. There are approximately 12.36 phase cycles in a year’s time causing the religious observances of Islam and Judaism to sequence over time through the entire calendar year. Easter, however, has its limits from as early as March 22 to as late as April 25. The general rule for the occurrence of Easter goes like this—the first Sunday after the first full moon after the vernal equinox. That will establish correctly about 80 percent of Easter dates, but it will not work this year, even though the full moon occurred after the vernal equinox. The first moment of spring happened on March 20, at 6:01 p.m., EDT just hours before the full moon at 9:46 p.m., EDT. The discrepancy lies in the Church’s definition of the vernal equinox and the ecclesiastical full moon which differs from their astronomical meanings. The ecclesiastical formula for Easter proceeds like this. It is the first Sunday following the first ecclesiastical full moon (the 14th day of a tabular lunation starting with the new moon) that occurs on or after the day of the vernal equinox. According to the Church, the vernal equinox always happens on the 21st of March. The true vernal equinox, when the sun is at an ecliptic longitude of zero and overhead on the Earth’s equator, usually happens on either the 19th or the 20th of March, but it can occur on the 21st. The phase period or synodic cycle of the moon is 29.53 days. 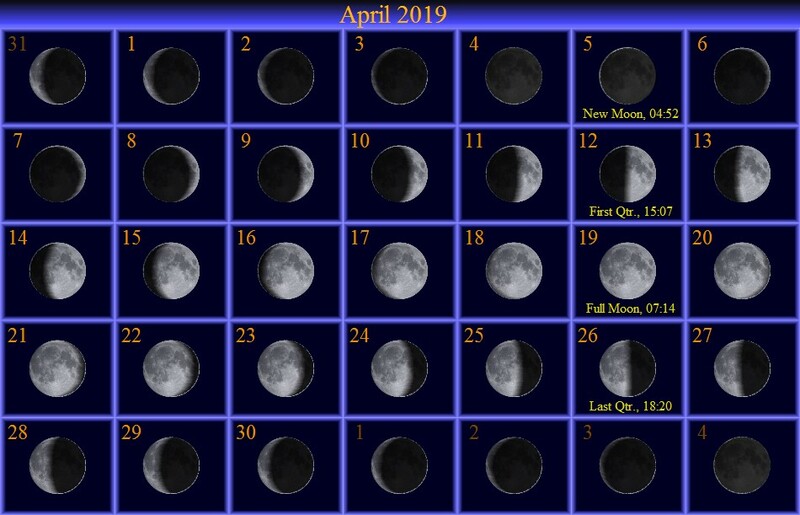 After a synodic month begins, the full moon will essentially happen halfway through that period, or at 14.77 days, not 14 days after the new moon. So this year, the 14th day of the moon occurred before the Church’s definition of the vernal equinox, March 21, and the date of Easter moved forward to the next ecclesiastical full moon in April, Thursday the 18th, about three-quarters of a day before the true full moon on Good Friday, causing Easter to be celebrated on Sunday, April 21. Easter also occurs specific to one’s time zone, whereas the sun crossing the vernal equinox happens at a specific instant and is different for each time zone throughout the world. As an example, while a person on the East Coast may be having Easter brunch in the early afternoon on April 21, it is already Monday in places like Australia and much of Asia. This week, you can watch the Easter moon start to blossom almost as soon as Luna begins to move west of the sun. On Sunday, a razor thin, 7 percent lit crescent moon, looking like a thin-lipped smile, is positioned 15 degrees above the western horizon 45 minutes after sundown. The following evening the “smiley moon” with a more vibrant grin is approaching Mars (above and to the moon’s right) with the bright star Aldebaran and the Hyades, a V-shaped cluster of stars above and to the left of Luna. Observe an hour after sundown and use binoculars for the best views. 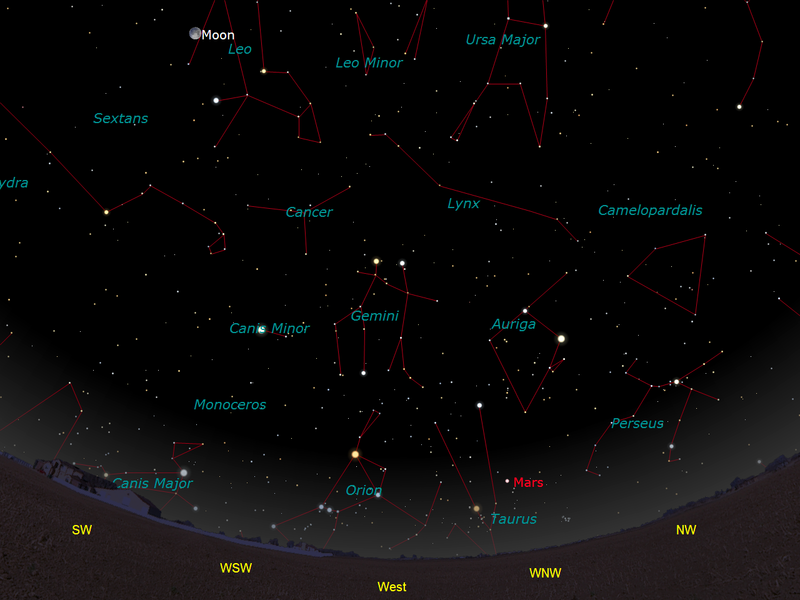 By Tuesday, Luna, with a Halloween pumpkin laugh is directly above Aldebaran with Mars below and to the right. 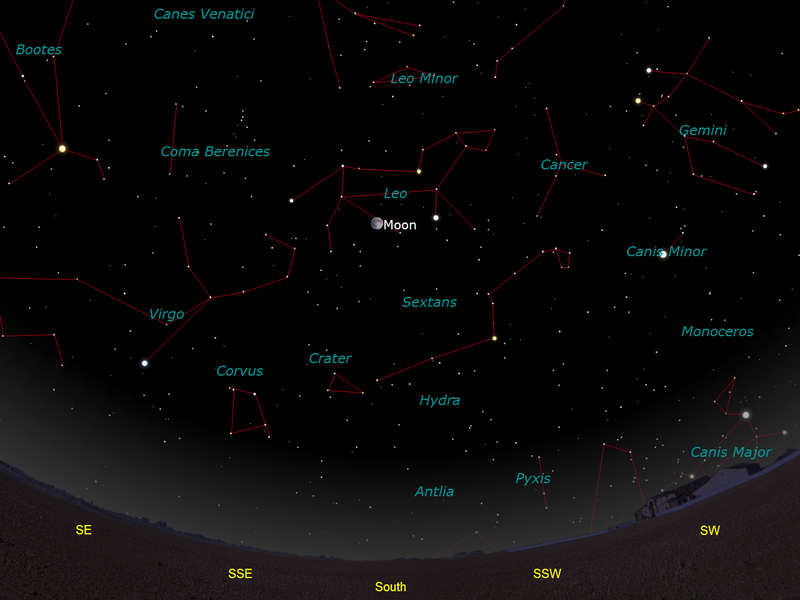 On Wednesday and Thursday, the moon passes Orion the Hunter, now in its sideways, setting position towards the southwest. 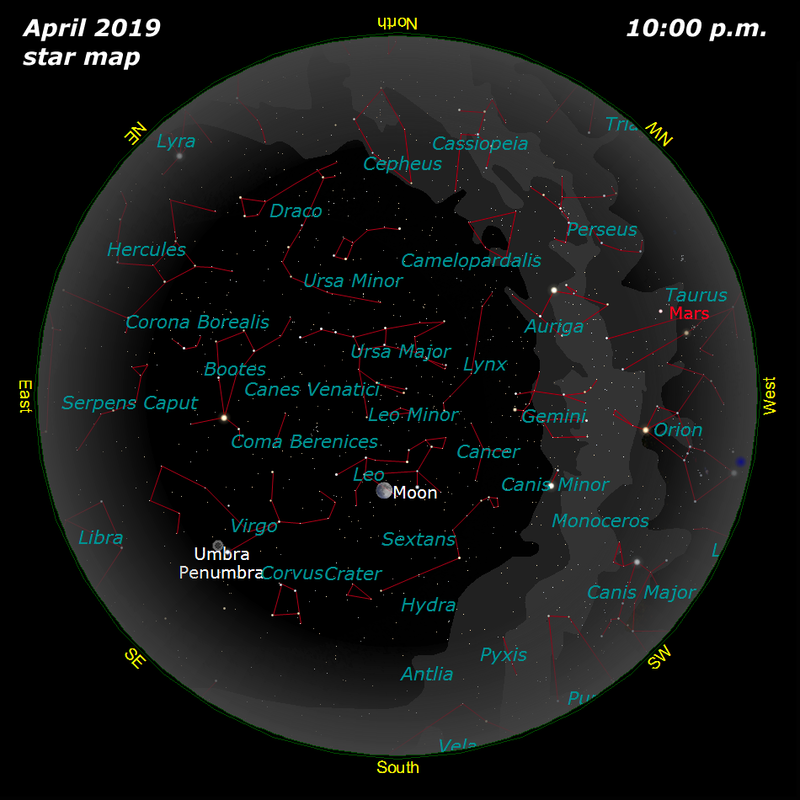 By Friday, in the evening sky, the first quarter moon is only seven degrees to the left of Pollux, in the constellation of the Gemini Twins, just six days from the ecclesiastical full moon and 9 days before Easter. Greening grass, warming temperatures, and a crack of thunder have all pointed to the winding down of winter and the flowering of spring. The sky has had the same attitude with darkness on the wane and the late Easter moon waxing to full on Good Friday. My students are starting to use the Sky Deck which has a spectacular view of the Lehigh Valley, but brighter stars still cannot hide on a clear, crisp vernal evening. There is a treat in this week’s sky if you are willing to follow the arc of the Big Dipper’s handle, now high in the northeast after the last glow of twilight has passed. The three, curved handle stars appropriately point towards a bright, aging orangey giant star, Arcturus, the “bear watcher,” the fourth brightest luminary of the nighttime sky and the brightest star north of the celestial equator. It’s 37 light years distant. By continuing southeastward along the same path of the curve that revealed Arcturus, blue supergiant Spica will be “spiked.” Spica is actually a double star about 260 light years from the sun, and it is only one of two first magnitude blue supergiants visible in the heavens. 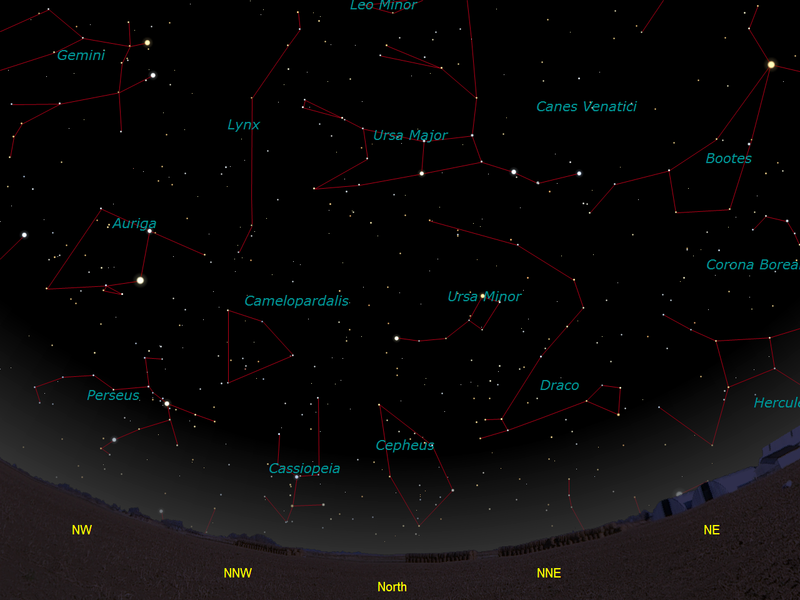 The other is Orion’s Rigel, now fading low in the west after twilight. 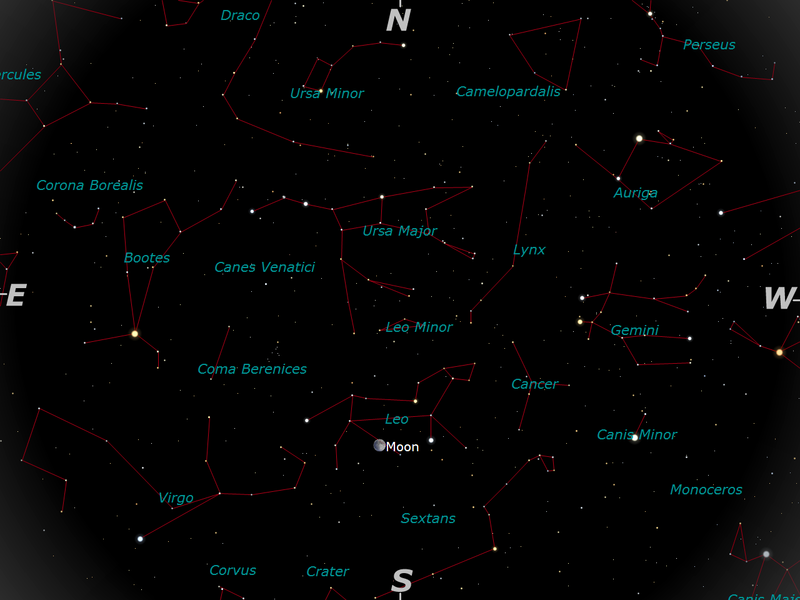 Spica is in Virgo the Virgin, and it is here where the huge elliptical galaxy, M87, can be found. At its center lies the black hole that was just imaged successfully in a two-year effort from data collected simultaneously by radio telescopes throughout the world, effectively making the Earth one giant receiving dish. 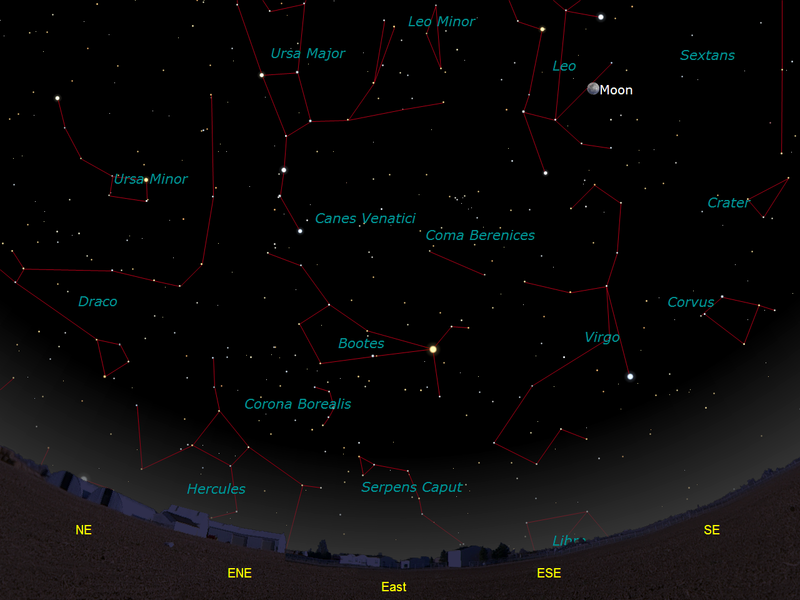 Here is how you can locate M87. On Wednesday, April 17 at 10 p.m., the nearly full moon will be positioned about 15 degrees above and slightly to the right of Spica in the southeast. By taking your hand and making it into a fist, thumb up, and holding it at arm’s length against the nearly full moon, the tip of your thumb will be pointing essentially towards M87. It’s not an object that can be seen with the unaided eye or even easily with small telescopes, but the system is huge, with about one trillion stars and a black hole at its center which is now estimated, at 6.5 billion solar masses. The imaging of the first black hole in the center of M87 will probably be remembered as one of the great technological achievements of the early 21st century. The resolving power of this giant multiple radio telescope system, named the Event Horizon Telescope (EHT), was enhanced to microseconds of arc. Keep in mind that is breaking a circle into 1,296,000,000,000 (1.296 trillion) parts. With these linked telescopes we could resolve the structure of an object that was 53 million light years distant, and only recently a theory. The five petabytes (one thousand million, million bytes) of data were collected in 2017, but it took nearly two years of computer crunching to assemble the picture of the doughnut-shaped object that was released to the media last week. And this is just one of several projects that is pushing technology to the edge of the impossible to reveal secrets of the universe that decades ago we thought impossible to achieve. These dazzling scientific achievements are also providing opportunities for small colleges like Moravian to put their mark on the map. A $20,000 investment from public donations bought the College a 25 percent timeshare in the Mars Desert Research Station Robotic Observatory near Hanksville, Utah, one of the darkest locations in the continental United States. For only $2000 Moravian could participate in the American Meteor Society’s fully automated global fireball network with all-sky cameras monitoring the heavens above the Christmas City from Collier’s Sky Deck on Main Campus. For $5000 more the College could have an automated, dedicated camera system to hunt for exoplanets from center city Bethlehem, also mounted on the Sky Deck. I saw the exoplanet detection unit at the North East Astronomical Forum at Rockland Community College in Suffern, New York on April 7. Just a few years ago, a similar system cost hundreds of thousands of dollars to become operational. Now the possibilities seem endless and the costs for doing real science on a shoestring budget are becoming more and more feasible.